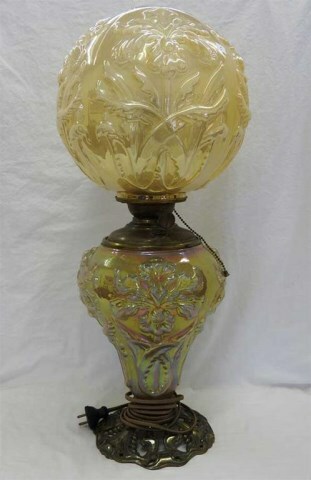 This is a Gone With the Wind style lamp, characterized by the two large globes. The bottom portion holds the kerosene, the top covers the shade. These are huge lamps and are usually found in marigold on milk glass. This one sold in 1997 for $6,500; others that have sold more recently have ranged in price from $2,500 to $4,200, though in 2009, one brought just $1,500 and in 2010 another sold for $925. Also see Sunken Hollyhock and Roses and Ruffles. Note that red examples are contemporary Fenton.